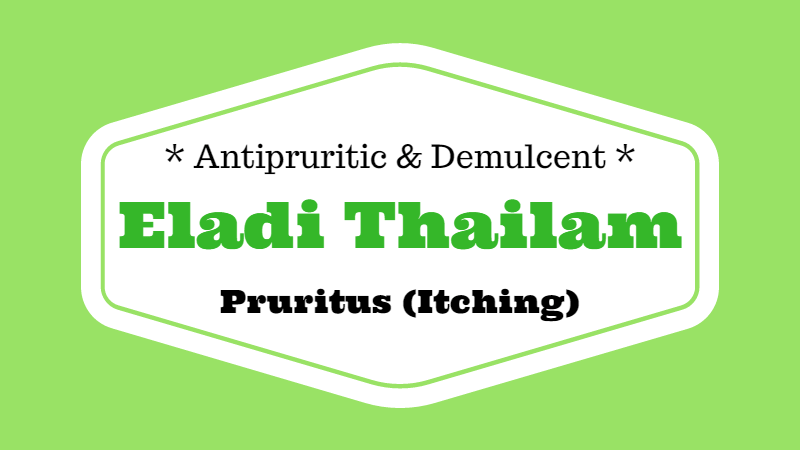 Eladi Thailam (Eladi Oil) is useful in the management of urticaria, pruritus (itching), boils, eczema, leukoderma, poisonous bites, chronic catarrh etc. It improves complexion and lightens the skin. It can be used in scalp massage as well as in body massage. Take all Kalka Dravya in powdered form and mix them in a small quantity of water to make Kalka (herbal paste). Now, mix Kalka (Herbal paste), water and Taila Dravya (either Sesame Oil or Coconut Oil) in a stainless steel vessel. Then, simmer the mixture until it remains the quantity of Taila Dravya and water content gets evaporated. Now, allow it to cool. Then filter the Eladi Thailam and discard the residues. If coconut oil is used in this preparation, then it is called Eladi Kera Thailam. All other ingredients are same. It is also prepared as the method explained above. Eladi Thailam pacifies Vata Dosha and Kapha Dosha. Eladi Kera Thailam also pacifies Pitta Dosha. Eladi Thailam and Eladi Kera Thailam are helpful in following health conditions. Take a few drops of Eladi Thailam and apply it on affected part of the skin. Leave it for several hours or overnight. It should be used 2 to 3 times a day. The external application of Eladi Thailam is absolutely safe in most individuals. It can also be used for children. There are no side effects reported with the external application of Eladi Thailam. There are no absolute contraindications for Eladi Thailam.